In 2-quart saucepan, place eggs in single layer; add enough cold water to cover eggs by 1 inch. Cover; heat to boiling. Remove from heat; let stand covered 15 minutes. Drain. Immediately place eggs in cold water with ice cubes or run cold water over eggs until completely cooled. Meanwhile, heat oven to 450°F. Remove pie crust from pouch; unroll on work surface. Cut into 6 rows by 4 rows, making 24 pieces; place on ungreased large cookie sheet. Bake 4 to 5 minutes or until tops are light golden brown. Remove from cookie sheet. Cool completely, about 10 minutes. Peel eggs; finely chop. In small bowl, mix chopped eggs, carrot, pepper, dip and mustard until blended. 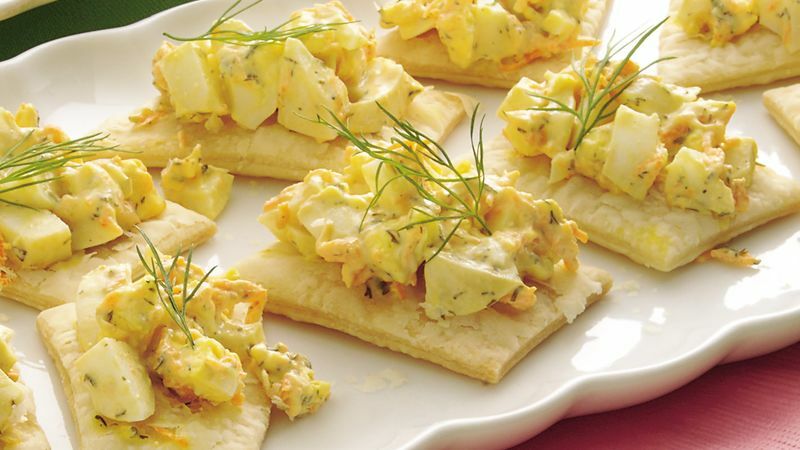 Spoon scant tablespoon egg mixture onto each baked crust piece; garnish with dill sprigs. Serve immediately. Crust pieces can be baked up to 24 hours ahead of time. Store them in a tightly covered container until you're ready to top them with the egg mixture.